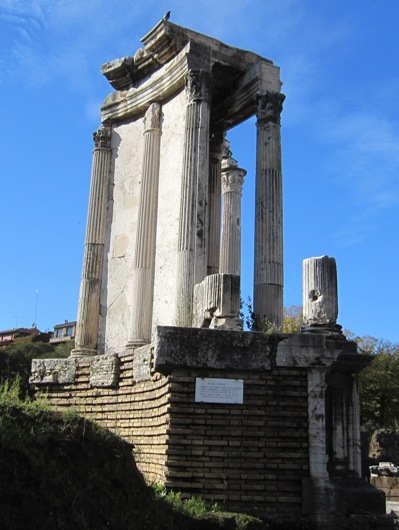 The Temple of Vesta on the Forum Romanum. Commodus was still quite popular with the people. The several attempts to assassinate him in the previous years had made him a very suspicious man though. Ever since the conspiracy in which the senators Ummidius Quadratus and Claudius Pompeianus Quintianus had been involved, now almost ten years ago, he deeply distrusted the Senate. In return, the senators felt little love for their emperor. The year 191 was marked by several tragedies. The emperor exiled his wife Bruttia Crispina to Capraea on suspicion of adultery and later had her executed. Probably also in this year, a great fire broke out in Rome. First, the Temple of Pax was destroyed, which Herodianus named “the largest and most beautiful building in the city” (see Rome: Santi Cosma e Damiano). The fire then spread for several days and consumed large parts of the city. The Temple of Vesta was destroyed, but the Vestal Virgins managed to save the Palladium, the statue of Pallas Athena which according to tradition had been brought from Troy to Italy. It was kept in the temple and the public were generally not allowed to see it. Scores of citizens were fighting the flames, but the fire kept raging on. Only when heavy rain began falling (Herodianus) or when there was simply nothing left to burn down (Dio) did the fire peter out. Commodus was beginning to show ever more erratic behaviour. He dressed himself in animal skins and wore a club, calling himself Hercules. He also began naming the months of the year after himself and wanted to rename Rome ‘Commodiana’. He had many statues erected of himself as Hercules and made important changes to the Colossus, the colossal statue of the sun god Sol next to the Amphitheatrum Flavium (better known as the Colosseum). Commodus had the head of the statue replaced with a replica of his own head. Dio claims he also gave the statue a club and had a bronze lion placed at its feet, so that it now no longer resembled Sol, but Hercules, just like Commodus himself. The emperor believed that his age would be a Golden Age. Commodus would be best known to posterity as the emperor who became a gladiator. Sources like the Historia Augusta claim he was involved in some 1.000 gladiatorial fights and Herodianus writes that he had the text “Conqueror of a Thousand Gladiators” engraved on the base of the Colossus after he had transformed it into a statue of himself as Hercules. Yet it also becomes clear from our sources that he first of all killed many animals in the arena. The emperor was very good with the bow and the javelin, surpassing his Parthian and Moorish trainers in skill. Commodus usually killed his victims from a platform, making sure that he did not risk his own life and limbs. The people appreciated his shows in the arena, especially since he killed many exotic animals, including previously unknown species from India and Ethiopia. 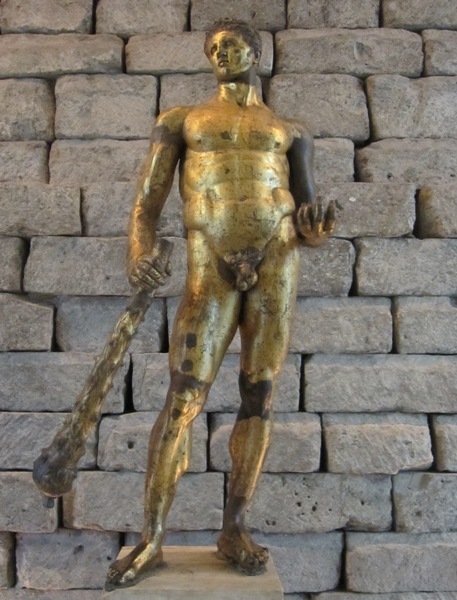 When Commodus performed in combat against other gladiators, he liked to fight as a secutor, the heavily armed gladiator that was the traditional opponent of the retiarius, who was armed with a trident and a net. Yet we can assume that most or all of his bouts against other gladiators were in fact mock fights. Real fights were simply too risky for an emperor who had already survived a couple of assassination attempts. At a certain point, Commodus refused to live in the imperial palace any longer and moved to the domus Vectiliana, which was the location of a gladiatorial school (ludus magnus). 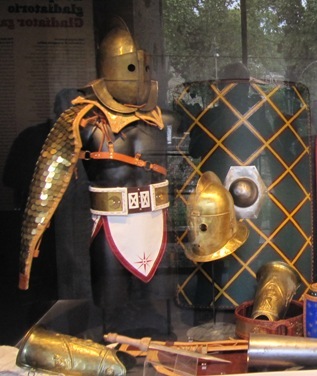 The equipment of a secutor. Libitina was a Roman goddess of funerals and from the Historia Augusta we can deduce that the gate in the Colosseum through which the bodies of slain gladiators were dragged out may have been named after her (porta Libitinensis). Although this name is hard to establish with certainly, we do know that Commodus met Libitina on 31 December 192, when he was murdered by people close to him. The plot to murder the emperor had been devised by three people: Eclectus, the emperor’s Egyptian chamberlain (cubicularius), Marcia, the emperor’s favourite mistress, and Quintus Aemilius Laetus, one of the praetorian prefects, who was from Thaenae in Africa (now the city of Sfax in Tunisia). Commodus had planned to spend New Year’s Eve at the domus Vectiliana and then show himself to the people again in the guise of a gladiator on the first day of the new year. According to Herodianus, the emperor had plans to get rid of Marcia, Eclectus and Laetus and had written down their names on a wax tablet. A young boy nicknamed ‘Philocommodus’, who was a personal favourite of Commodus, had taken the tablet to play with. He then by chance met Marcia, who took the tablet from him and found out that the emperor wanted to kill her. The story seems far-fetched and Marcia and her co-conspirators may have had other reasons to get rid of Commodus, whose behaviour had grown ever more erratic. Dio claims that the plot was actually hatched by Eclectus and Laetus, who then employed Marcia to execute the plans. In any case, Marcia tried to murder the emperor by adding poison to his food (Dio) or drink (Herodianus). This did not work, as Commodus began vomiting up the poison. The conspirators then had him strangled by an athlete named Narcissus. The tyrant had been killed, but what to do next? The conspirators decided to spread the rumour that Commodus had died from a stroke. Laetus and Eclectus now approached Publius Helvius Pertinax, a 66-year-old senator of very humble origins who had had a very successful career in the army. Pertinax was born in Alba Pompeia in Liguria as the son of a freedman. After an unsuccessful stint as a teacher, he joined the army, serving with distinction in the Parthian War of the 160s. After that he had, among other positions, served as proconsul of Africa and – perhaps just briefly – legate of Syria. Pertinax seems to have been friends with Claudius Pompeianus, Lucilla’s second husband and Marcus Aurelius’ son-in-law. In 192, he was praefectus urbi, and he had used his urban cohorts to protect the people when they were attacked by Cleander’s horse guards. Laetus, Eclectus and some their supporters went to his house in the middle of the night. At first, Pertinax believed that they had come to kill him. This was not the case. The conspirators took him to the Castra Praetoria, where a large crowd had already gathered. The people had heard about Commodus’ death and Pertinax was possibly quite popular, the people remembering how he had intervened on their behalf against Cleander’s men. They began shouting and proclaimed Pertinax Augustus. The praetorians were now more or less forced to accept Pertinax as the new emperor, but they were hardly enthusiastic. Pertinax promised them a bonus (donativum) of 12.000 sesterces each to win their loyalty, which was enough for now. The new emperor then proceeded to the Senate, only to find the doors of the Curia locked. The session was therefore moved to the nearby Temple of Concordia. Pertinax said to the senators that he did not want to be emperor “because of my age and feeble health, and because of the distressing state of affairs”. The refusal does not seem to have been genuine, and the Senate quickly accepted Pertinax as the new Augustus. Dio was there and would later write that the new emperor was “not only most noble in spirit but also strong in body”, except for a small problem with his feet. – Historia Augusta, Pertinax 1. – Adrian Goldsworthy, The Fall of the West, p. 54-57. Killing the Nemean lion was one of the twelve labours of Hercules. The Historia Augusta claims he paid only half the amount, but Dio asserts that Pertinax “gave to the Pretorians all that he had promised”.